The Library of Congress has digitized many of Roy Stryker’s killed negatives, and I was immediately drawn to the black dot created by the hole punch. When printed, the hole punch appears as a small black sphere hovering over a face or a rural landscape. The dark round circle, randomly punched, reads as a contemporary mark, echoing interventions by artists such as Yayoi Kusama and John Baldessari. My work as an artist examines the influence of chemical companies on our food supply and the connection between corporate interests and public health. In the same way Stryker crafted the narrative of the Great Depression through photo editing, chemical companies such as Monsanto and Dow Chemical frame their stories through the curated photos they publish online. 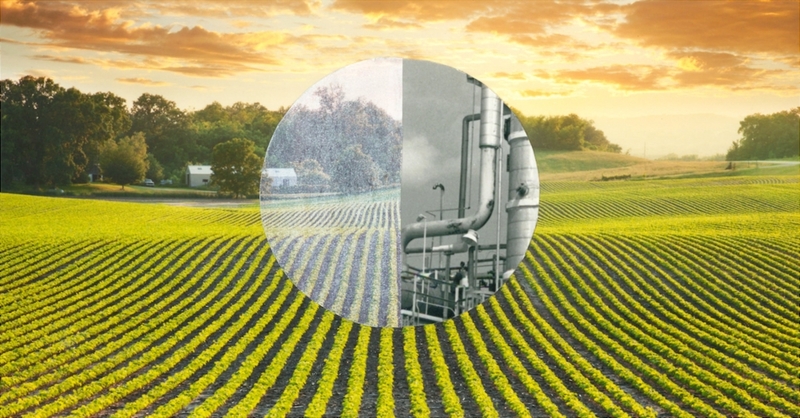 Their websites feature striking images of sunny fields and healthy crops, noticeably obscuring their own polluting history of chemical manufacturing. They position themselves as modern agricultural companies, supporting farmers and acting as sustaining stewards of the land, while actively concealing their pesticides’ decades-long toxic impact on the soil. The FSA documented huge swaths of American life, but I’ve chosen to examine one sector—chemical companies—in this collage project, titled Our Roots Run Deep. I’m particularly interested in how chemical companies curate their images to deliberately conceal their pasts. The project repurposes contemporary photographs and historic press photos, and employs a variety of circle interventions to collapse the distance between past and present narratives. The black dot found in Stryker’s hole-punched negatives serves as a compositional tool throughout the project. Black-and-white photographs of chemical factories are situated against color photographs of fields of corn, soy, canola, wheat, and alfalfa. Cutouts, hole punches, collaged spheres, and ink circles are introduced and serve as viewfinders, a resting point to focus the eye. It is this back-and-forth between bleak chemical plants and fertile farms that underscores the industry’s false narrative. “Our Roots Run Deep” is also a tagline currently used by Dow Chemical telling their story of seed development, farmer support, and allegedly sustainable solutions to preserve the environment. But, of course, there is more to the story. Dow and Monsanto’s promotional images project an idealized version of farming; by choosing photos with strong emotional impact, they aim to give the impression that they are feeding the world and protecting the planet. By creating a direct and truthful relationship between their actions and the consequences, Our Roots Run Deep spotlights persistent corporate greenwashing and reveals the chemical legacy of these companies. Kirsten Stolle is a visual artist working in collage, drawing, and mixed media. Her research-based practice is grounded in the investigation of corporate propaganda, food politics, and biotechnology. She has recently shown her work at NOME Gallery, Berlin, and the Southeastern Center for Contemporary Art, North Carolina, among many others.